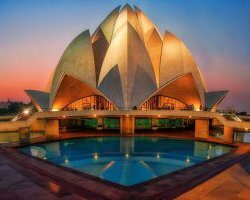 The Lotus Temple, also known as the Bahai House of Worship, is one of the must see attractions in Delhi, the capital city of India. It is situated near Nehru Place near Kalkaji and Kalkaji Mandir Metro station. Travelers from all around the world come to Delhi to visit the architectural wonder of Lotus Temple. And of course, the Lotus Temple’s stunning architecture surrounded by beautiful water pools and gorgeous gardens never fail to lure the visitors. The Bahai House of Worship was built in 1986 in New Delhi in shape of lotus. Hence, it is also famously known as Lotus Temple. Open to all, regardless of caste, creed and religion, the Lotus Temple’s building is composed of 27 free-standing marble-clad lotus petals. Petals are arranged in clusters of three to form nine sides. There are nine doors opening to the central hall with height of slightly more than 40 meters. The hall has seating capacity for more than 2500 peoples. You will experience a serene ambiance inside the hall. You will find pin-drop silence here. The beautiful Lotus Temple has won several architectural awards because of its stunning architecture and hear ceasing beauty. Furthermore, it has been featured in hundreds of newspaper and magazine articles because of its exceptional beauty and mesmerizing surroundings. The Lotus Temple plays an important role in bossing Delhi Tourism and India Tourism as well. It attracts a large gathering of tourists from all over the world including different parts of India. It has been one of the most visited tourist attractions in India and in world as well. According to a 2001 CNN report, it is the most visited building in the world. It is the most visited building in India, surpassing even the magnificent Taj Mahal (one of New Seventh Wonders of the World) with some 4.5 million tourists in a year. According to Guinness World Records 2001, it is the most visited religious building in the world. If you want to see the exceptional beauty of modern architecture then you should not miss the opportunity to visit the world famous Lotus Temple or the Bahai House of Worship in Delhi. This architectural wonder will never fail to lure you. It will give you a brilliant experience to cherish for the lifetime.